Today was the day, Brian, Pickles, Phinneus and I became cruisers! We did it, at least one day of cruising! It was not the greatest day in the weather category but that is what foul weather gear is for. There was a fair amount of rolling waves (about 2-3 feet) which kept us rocking and rolling for the trip! The dogs were not thrilled but they both cuddled on the blanket under our amazing new dodger. We sailed for about 3 hours until the wind died down and we ended up motor sailing for the rest of the way. Scout is now anchored at City Island, right near the NYC Police Firing Range, not the best location for peace and quiet but supposedly the shooting will stop at some point tonight. Kind of feels a lot like the background noise from Bridgeport. We are enjoying our first sundowner on the deck, dogs are asleep and Brian is cooking his favorite sausage stir fry! Yum for me. Now that we are actually on our way, Brian and I want to send out our special thanks to a few people who helped us get here. First and foremost a special thank you to everyone at Captain’s Cove Marina in Bridgeport, CT. Without the entire yards help we would never have made it. Each and everyone was truly invested in our adventure, and at every step they were there to help us solve our issues. A great family run marina and I would not hesitate to recommend any boat to winter there or stay on a slip for the summer, good people! Next down the list is the marine carpenter. Mike Whitman of Monroe Boat Shop, who we stumbled onto last fall when we pulled Scout for her refit. Without Mike’s carpentry skills, Scout would not look as gorgeous as she is with a new toerail and boom gallows, and the most important part of the refit, our new barndoor rudder which few will see is all of Mike’s creation. Brian and I are now lucky enough to call him a friend! Ed Brighindi from Tailorite created a custom dodger for Scout! We had nothing to offer as a pattern but we could not be happier with the results, and the dogs love the wind protection on the bridgedeck as well. There are so many others who gave their encouragement, advice, and skills to us, we could not have done without all of you, and a special shout out to Stephen & Catherine Wargo and Sherri Goldsmith, thanks for the friendship through it all. We are now signing off and enjoying our night on the boat. 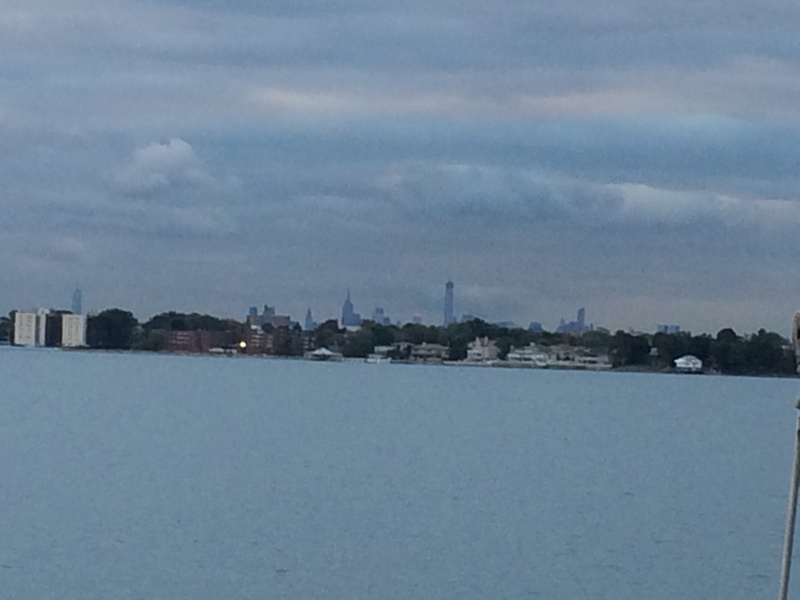 Good night from City Island. « 2 Days left to go!